The viewer is looking in a west-north-westerly direction along the transform fault in the Kane fracture zone, where the Africa Plate (upper right) and the North Atlantic Plate (left) are formed. This fracture zone is located in the central Atlantic ocean, on the slow-spreading Mid-Atlantic ridge between Africa and the Caribbean Sea. 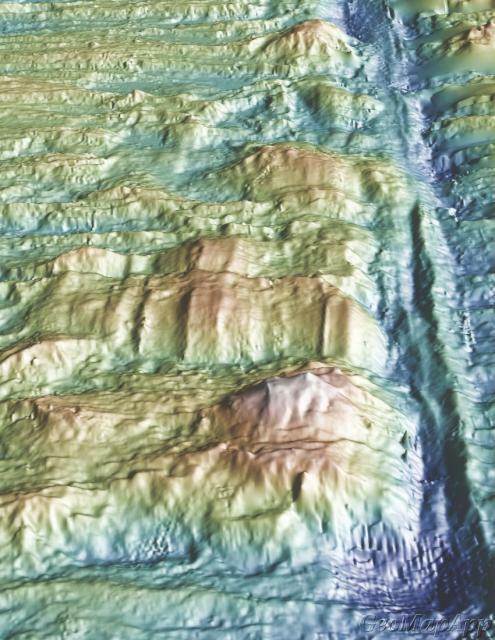 Shipboard multibeam bathymetry provides this closeup 3D view of the ocean floor; the checkerboard effect seen in part of the image is an artifact of the pattern made by the ships' tracks.